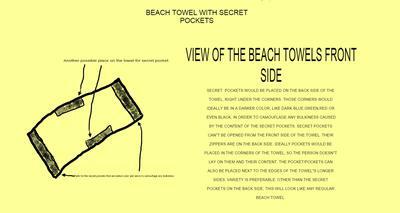 Hidden pockets hold all your valuables while you're on the beach having fun. Pickpockets will primarily target bags and clothes left on the beach and this invention allows you to store your valuables in an unusual place. Crowded beaches are usually an ideal place for pickpockets. People are reluctant to leave their valuables on the beach while taking a swim, so they come up with different solutions to protecting their stuff. For example,if they want to go for a swim they will take turns, so someone will always have to stay on the beach to guard the stuff. Another example is to bury the valuables under the towel which could definitely attract unwanted attention. 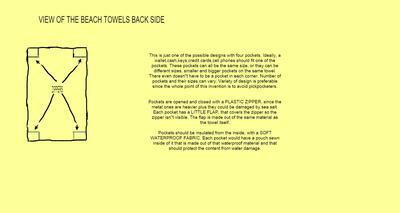 Beach towel with secret pockets looks like a regular beach towel except for the hidden pockets that will allow you to discretely put away your valuables.